flowing with delights, leaning upon her Beloved?" This scene sets the stage for the Assumption of Mary, the fourth of the Glorious Mysteries of the Rosary. Keep these events in mind as well as the fruit of the mystery which is the grace of a happy death as you pray the Rosary prayers. Some also find it helpful to look at a picture of the Assumption of Mary, the Blessed Virgin or listen to some uplifting music to aid in their meditations on the Rosary. This most glorious event in the life of Mary mother of Jesus is a favorite among Catholics who are devoted to the Virgin Mary. If you are familiar with the Assumpton of Mary please read below to freshen your memory. If you have never heard this story of the Assumption of Mary, I hope this brief retelling leads you to further investigate the theology behind this glorious event. Mary's time on earth drew to a conclusion. Around her bed knelt the apostles and disciples of Jesus. Her soul was surely filled with peace and joy as she eagerly awaited her reunion with Jesus, her Son. The Blessed Virgin Mary closed her eyes and fell asleep in death. Those present felt both an overwhelming joy and a profound grief. Joy that Mary was now united with her Son and grief at the loss of their Mother. They would have to wait for their own earthly journey to come to an end before they would see her and their Lord, Jesus again. The Apostles and the Holy Women prepared Mary's body for burial. They devoutly and lovingly laid her to rest. When the Apostles went to the tomb to pray the following day, Mary's body was gone, replaced with the sound of birds singing and the lovely scent of flowers. Mary was conceived without sin and Jesus would not allow her body to decay. The devil had no power over her. Jesus took her, body and soul up to Heaven where He had a place prepared for her. There she is now, among the angels and the saints praising God and interceding on her dear children's behalf. The Assumption of Mary into heaven is not recorded in Scriptures. It can however be deduced from Scripture and is a dogma of the Catholic Faith. The following Bible passages will aid your Rosary meditations on the Assumption of Mary: Canticle of Canticle 2:10-13 and Luke 1:46-50..
"Thou art all fair, O my love, and there is not a spot in thee." Here are some additional thoughts to enhance your meditation on the Assumption Of Mary rosary mystery. Return often to this page when you are praying this Glorious Mystery of the rosay - Assumption Of Mary. Death had no power over Mary whose soul was spotless just like that of her Son, Jesus. Suffering and death are the results of Adam's sin. But because Mary resembled Jesus in all things, it was truly fitting that she too would experience death. Why is death so frightening? Uncertainty of what is to come makes it scary, but certainty in your eternal salvation makes it sweet. Attachment to things of this world as well as the lack of control you have over death also make it frightening. Peace of mind will be your greatest friend at the hour of death. Mary's death was holy and sweet because she was certain of her eternal home, heaven, and she was not attached to any worldly things. St. John, the beloved Apostle cared for Mary fulfilling Jesus' request from the cross. Jesus' purpose in asking St. John to care for Mary was twofold. He was giving Mary to all mankind as their own Mother, and He was setting an example. Jesus was making sure His mother would be provided for. You are obligated to be sure your parents' needs are provided for as well as any elderly people you know. The Fourth Commandment of God is to "Honor thy father and thy mother." Providing for your parents needs in old age is the duty of adult children. Mary was completely attached to God and detached from all worldly things. She happily embraced death because she knew she would be even more closely united to God. Her mind and heart were always in the loving presence of God. When she died she passed from a world of darkness into a world of light, from faith to vision, from hope to fruition. If you prepare your soul for death, when your time comes it will be much more peaceful. 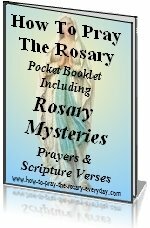 You have noticed that each mystery of the Rosary has it's fruit. The more often you pray each mystery and ask God to send you the grace to practice that fruit the holier you will become and your life will more closely resemble the life of Jesus. Now in this the fourth mystery, The Assumption of Mary, of the final group of glorious mysteries of the rosary, you can see that Mary perfected all these fruits. How did they become so holy? But finally, I know the key to the holiness they attained. This key is none other than the Rosary. It's mysteries are the mysteries of the faith of Jesus Christ. And it's fruits are the fruits of holiness. The Rosary will make you holy. Mary was the perfection of all the fruits of the Rosary. Mary's humility shined through despite the privilege of being the Mother of God. Mary's love of neighbor is demonstrated in her tender compassion for the souls of her children here on earth. Mary completely embraced poverty and never wanted for anything. She knew God would provide for all her needs. Mary's obedience is most beautifully illustrated in the Annunciation. When God asked, Mary answered "I will". Mary lovingly trusted in God. Mary's purity is shone forth in her modesty and meekness. Mary's courage was demonstrated by her trust in God at many times. All the events of the joyful mysteries show this courage. Mary was unfailingly patience in all the sufferings she underwent. Mary's hope was most beautifully shone at the Wedding Feast at Cana when she told the servants, "Do whatever He tells you." Mary had a zeal for the glory of God. Her love of God was perfect and her will was completely conformed to His. When considering these words from the prophet David, think of Jesus and His mother Mary. Because Mary carried in her holy womb Jesus the Lord, she is the new Ark of the Covenant. This verse is a foretelling of Jesus' ascension followed by the Assumption of Mary. It is true that the loss of a loved one brings about great pain and sorrow. But a true Christian that has faith can turn that sorrow into joy with the knowledge that their loved one's pain is over and that their soul is at peace. At the end of time, Jesus will come again to judge both the living and the dead. This is known as the final judgment. At that time, your body and soul will be reunited and glorified the way Mary's was, as in the assumption of Mary, if you live and die in God's grace. Pray that you are taken up to heaven by God's holy angels at the time of your death. Keep your hope in heaven and make your life a reflection of Jesus' and this privilege that Mary enjoyed will be yours as well. While on earth, Mary experienced pain, sorrow and even death. But in heaven, she was glorified and made beautiful beyond all human imagination. In heaven, she can no longer experience suffering or sorrow. She is clothed in splendor and light, just like Jesus' transfigured body on Mount Tabor. As in the Assumption of Mary, heaven awaits your coming as well. "But our conversation is in heaven; from whence also we look for the Saviour, our Lord Jesus Christ". This promise from Jesus should give you confidence and certainty in your eternal salvation. Dear Lord Jesus, Thou art seated at the right hand of the Father in all Thy glory. I thank Thee for giving Thy own Mother, the Blessed Virgin Mary to be my Mother as well. I will always honor her and ask for the graces you have allowed her to distribute. I am sorry for the times I have failed to call upon her for assistance and for the times I have not listened to her messages that call me to prayer and penance. 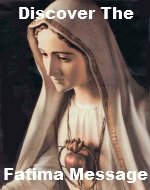 I pledge to pray the Rosary everyday in fulfillment of her requests at Fatima, in reparation for the sins of the world and for the sacrileges committed against Thee my dear Savior. Please grant me a happy death. Preserve me from a sudden death and send me the grace to live each day as if it was my last. So that I will be ready to meet Thee and render an account for all my actions, good and bad that Thou as the Just Judge must deliver.